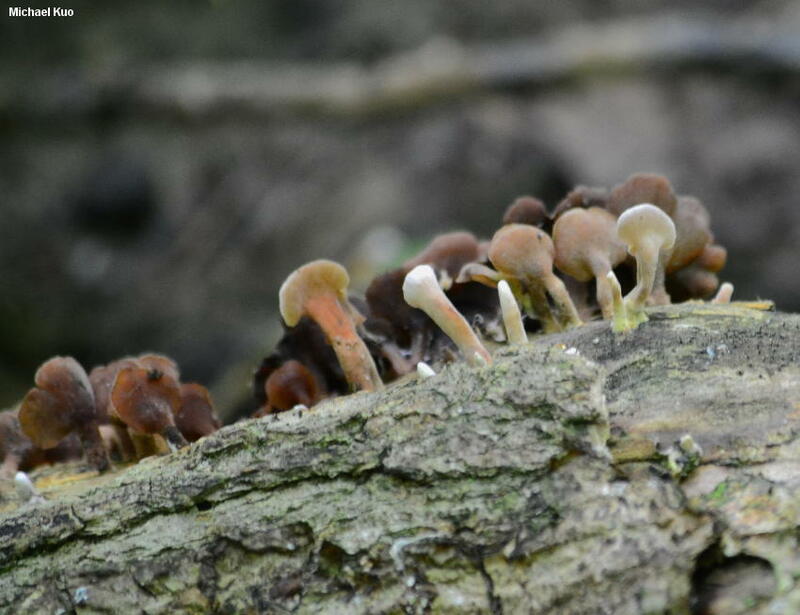 This little guy looks like a miniature satellite dish with a fuzzy stem, lined up with his tiny buddies on decaying hardwood logs. 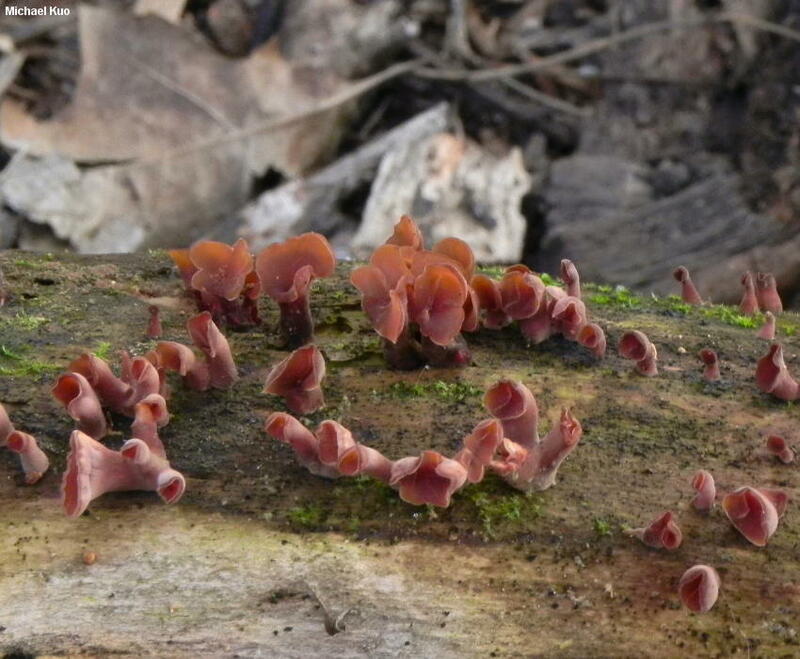 Dacryopinax elegans is actually a jelly fungus, but it doesn't seem very jelly-like until you try pulling it apart, whereupon its tough but gelatinous consistency becomes apparent. 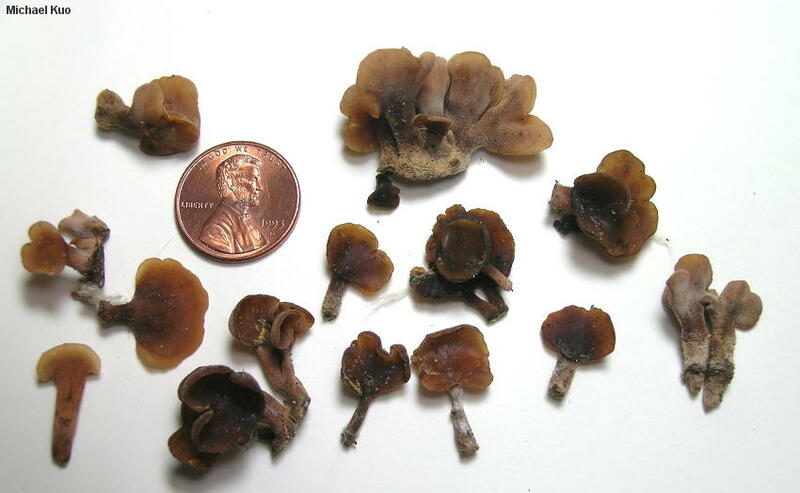 The species is widespread in North America from the Great Plains eastward, and its range extends into the tropics. Although microscopic analysis is probably not needed to identify Dacryopinax elegans, it has interesting microfeatures--including Y-shaped basidia and spores that become 1-3-septate. 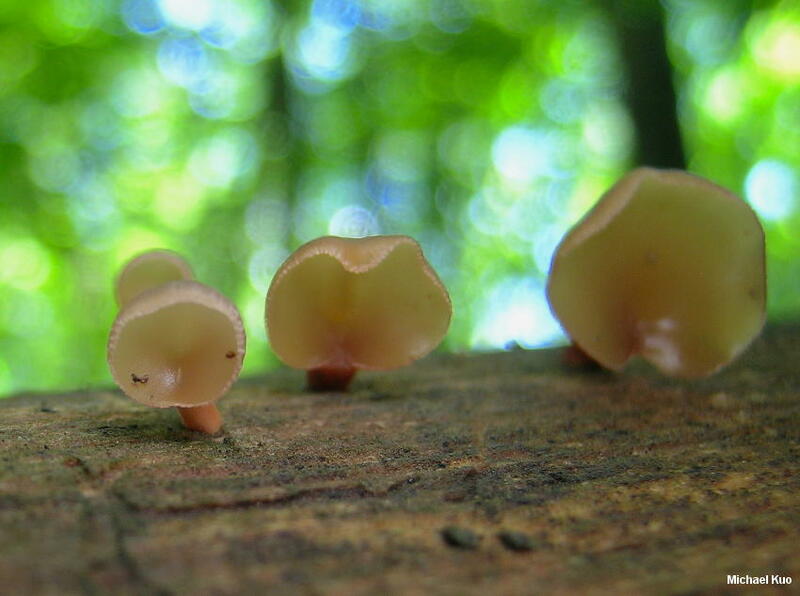 Dacryopinax spathularia is somewhat similar, but yellow--and shaped differently, a bit like a spatula. Ecology: Saprobic; growing gregariously on the well-decayed, barkless deadwood of oaks and other hardwoods; spring through fall; widely distributed east of the Great Plains, and into the tropics. The illustrated and described collections are from Illinois. 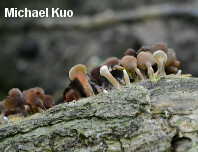 Head: 4-20 mm wide; shaped like a shallow cup balanced on its edge, or fan-shaped to somewhat irregular (but always concave, with the spore-producing surface on the inside); inner, spore-producing surface bald, shiny, and brown to lilac brown or dark brown; outer, sterile surface minutely granular-fuzzy, pale pinkish brown to reddish brown; margin sometimes becoming very finely scalloped or fringed; often becoming contorted and irregular as it dries out. 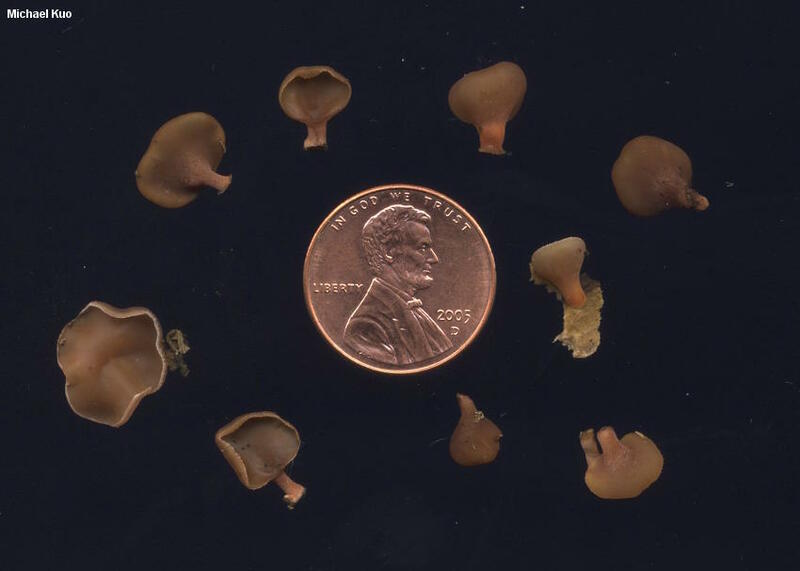 Stem: 2-20 mm high; 1-3 mm wide; more or less equal; confluent with outer surface of head; minutely granular-fuzzy; pinkish brown to reddish brown. Flesh: Brown; tough but elastic. 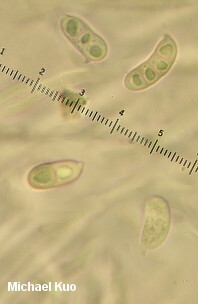 Microscopic Features: Spores 11-17 x 4-6 µ; widely allantoid; becoming curved; smooth; hyaline in KOH; at first aseptate, with uniform granular contents; developing 1-3 septa, with individual guttules in each divided section. 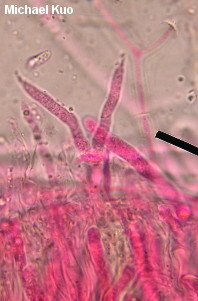 Probasidia cylindric to clavate, about 50 µ long and 2-4 µ wide, developing 2 apical prongs. Basidia Y-shaped; to about 75 µ long; with prongs to about 25 µ long; aseptate. 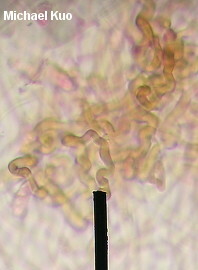 Elements from abhymenial surface (hairs) filiform; brown in KOH; often curved and curly-tipped. Bulbous septa present; clamp connections absent. REFERENCES: (Berkeley & M. A. Curtis, 1813) G. W. Martin, 1948. (Saccardo, 1888; Coker, 1920; Olive, 1947; Martin, 1952; Lowy, 1971; Sierra & Cifuentes, 2005.) Herb. Kuo 11050501, 11010902, 06161004, 05291102, 07141402.